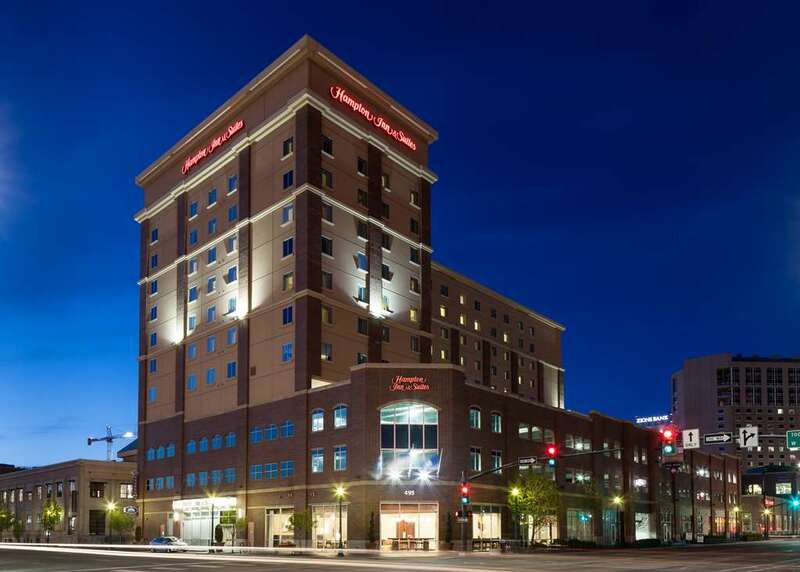 The Hampton Inn - Suites Boise/Downtown is in the heart of it all. Surrounded by Boise*s top restaurants boutiques and entertainment venues. Located close to Boise attractions that include Qwest Arena /sporting events concerts/ Boise Center on the Grove /Convention Center/ Boise Zoo Boise Art Museum Boise History Museum Boise River State Capitol and Boise State University. Our 186 room hotel features large comfortable guestrooms complimentary wireless high-speed internet access 24-hour complimentary business center indoor **Cool Pool** and whirlpool exercise facility and 4 000 square feet of banquet/meeting space. Enjoy our complimentary On the House hot breakfast or grab our On the Run Breakfast Bags on weekdays if you are pressed for time. Centrally located in the heart of Downtown Boise Idaho we are located within four miles of Boise Air Terminal/Gowen Field Airport. Whether you are just passing through or spending time in area we invite you to stay with us and enjoy the comforts and the warm hospitality our team extends to our guests everyday. We love having you here.